Without knowing who the owners of Denica’s were, it warms my heart to have been served by both James and Denica, with such a loving and personable attitude. I’m stationed at Camp Parks and whether I’m in uniform or NOT, James ALWAYS shows his appreciation for the Military. He takes time to KNOW his customers. That’s a natural trait. Only if I lived in or around Dublin (Im in East Contra Costa), I believe I would apply for a position. I love the website and your establishment seems it would be a great place to work. Visited my three grandchildren this week end, and had breakfast two days in a row. Great food and service! Fantistic pastries! James personally served my coffee and greated me. Loved the family atmosphere, especially the family photo’s adorning the walls. We have been coming to Denicas for over a year now and just love it. The food is down home style and there is always plenty of it. It is so good and we keep coming back for more. My favorite is the chicken salad sandwich and green salad with cranberries and sugared walnuts, the dressing really compliments the salad. I wish they serverd the mushroom bisque more often. The people that work there are so nice and friendly, its no wonder it has become so popular. My husband loves the cornmeal pancakes. Denica made a cake for me 14 years ago when my daughter turned 1. It was a Clifford cake. That was when she had a little kitchen in CastroValley. Although I wish she still made cakes I am happy that their cafe is right down the street from where I live. Looking forward to trying everything on your menu! I just had to stop and say how many wonderful things I’ve heard about your shop from firends of mine in the Livermore area. I have to come and see yo soon! I sure miss your cooking/baking! I lived for those cookie baskets you made us a Christmas at Brides n Belles. Been to the Dublin Denica’s a couple months back. Food was fantastic. Going to the Livermore Denica’s today. Really looking forward to it, expecting the same quality. Highly recommend the one I’ve been to so far. Two thumbs up. We love your restaurant! We NEED one is Castro Valley!!! Agreed!!!! Desperately needed in Castro Valley! Denica’s has become a regular craft services go-to for production crew when I am in town. The Strawberry Waffle is my personal fave. Chocolate Os for take out for the crew. This establishment looks and sounds amazing! After reading about Denica’s history and her story with James, I would more than love to work for Denica’s Real Food Kitchen. I have been coming to Denicas for years, even before they expanded. It’s our number one hidden jewel in Dublin. Denica is so nice, she even helped me back in the day when I was doing weight watchers. Telling me what I can eat and modify on the menu. I’ve introduced so many friends and family to Denica’s over the years, that they are now addicted to going at least once or twice a week. We love the stories on the walls. It truly tells us a story of love and family. My husband and I told our in-laws on a giant chocolate chip cookie that we were expecting. They were so excited to see the box of cookies but their mouths dropped when they opened the box with the exciting news written on the cookie! Denica’s is truly a little piece of heaven! Had to laugh after reading your bios. Noticed that you were coming to Castro Valley. We had been meeting our son and his wife at your Livermore locations. I fell in love with the cinnamon rolls all the while thinking I haven’t had cinnamon rolls this good since Cookie Express was in CV. I had no idea. Fell in love with those Cinnamon rolls when I was pregnant the my youngest and would stop for my morning fix. Started with the mochas after she was born, James always commented about her footee PJ’s. She is 23 yrs old now. So glad to see you are happy and growing. We will be in when you open. CV needs a good place to eat ! James and those cinnamon rolls!! I fell in love with him over a latte 😉 at Cookie Express! We are excited to serve our hometown, and looking forward to seeing you soon! We just had breakfast at the Walnut Creek location…to round out visits to all three locations. 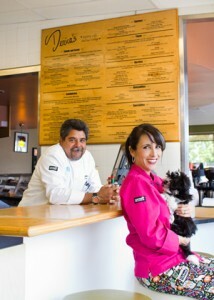 We are so looking forward to your opening in Castro Valley…almost within walking distance! We moved to the tri-valley area 6 yrs ago and got introduced to Denica’s in Dublin by a coworker of my husband. Ever since then we’ve been coming back over and over again! The food is amazing and the service is top! Absolutely love the homey feel of this place. Just by looking at all the beautiful family pictures on the wall, it makes you feel like Denice and James are one of our friends 🙂 We’ve brought many friends here through the years and everyone fell in love! And this will be the restaurant that my 8-year-old remember as a family favorite when she grows up. 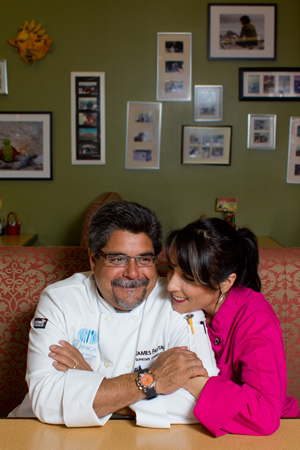 Thank you to the wonderful couple who put your heart and love into your food! HI! Today was my first day at Danica's Real Food Kitchen! and it was awesome! the person who took my order was James (Castro Valley location)and he was really nice I will be coming back again because of him and the atmosphere! i saw James even walking with a hop in his step to the beat of the music. He is happy and that means this is a good family! I have rewards card and will be bringing my family members here! i love the train table! I even played with the trains myself 🙂 I even got a free pastry of my choice because it was my first time! keep up the good hard work and loving your customers its paying off!! !